Professor Gary Gibbons (e2002) comments on the suggestion that time is disappearing from our universe. Read more: http://bit.ly/1siWUTt. Prof Rebecca Fitzgerald (e2002) has developed a ‘pill on a string’ to aid diagnosis of oesophageal cancer. Read more: http://bbc.in/1Ab769t. Edward Stourton (1976) on the Appeal of a Caliphate. Read more: http://bbc.in/1wAUpAR. The talks from this year's Annual Members' Luncheon - including Sir John Bradfield's reflections on his time as Senior Bursar - are now available to watch on our Youtube channel: http://bit.ly/1xVdlJH. With great sadness, the College announces the death of Sir John Bradfield (1925-2014). He died at Great Gate yesterday evening, 13 October, on the way to a dinner. Born in 1925, he was Senior Bursar from 1956 to 1992. During that time he led the College in establishing Trinity's Science Park and in developing Felixstowe into Britain's largest international port. He was instrumental in the foundation of Darwin College, where he was an Honorary Fellow. The importance of Sir John's contribution to the College, the University and the City of Cambridge cannot be overstated. His long and very successful period as Senior Bursar leaves a legacy which will immeasurably enhance the life of Trinity for generations to come. A non-insulin cure for diabetes is in reach with the advance being a culmination of 23 years of research by Professor Doug Melton (1977). Read more: http://thetim.es/1th1asu (subscription required). Professor David Runciman (1985) on the lack of stature in today's politicians. Read more: http://bit.ly/ZS4PQp. Interview with BFI General Counsel Richard Brousson (1991). Read more: http://bit.ly/1pPrTVW. Eleanor Collins (2010) is the winner of the 2014 Harvill Secker Young Translators' Prize. Read more: http://bit.ly/1t11lrH. Feature on Dr Suchitra Sebastian (e2005) and her work on superconductors. Read at: http://bit.ly/1uAWPjx. 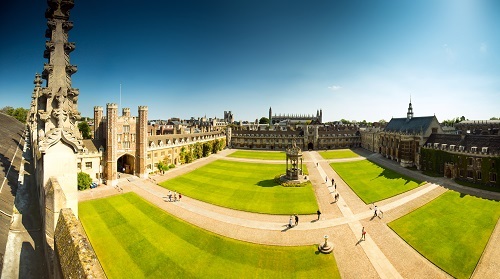 University of Cambridge ranked joint second in the world's top 20 universities 2014. Read more: http://bbc.in/1u0pK00. Trinity College Graduation Information (M.A. & Higher) is available for [download here] . Eddie Redmayne (2000) stars in 'The Theory of Everything', detailing the life of Prof Stephen Hawking. Read more http://bbc.in/1nHT18u. Former Master, Professor Martin Rees (1962), Professor Huw Price (e2011) and Professor Sir Partha Dasgupta (1962), Founders of the Centre for the Study of Existential Risk. Read more: http://bit.ly/1raECpS. As one of the 10 confirmed speakers for TrinTalk: 2014 on September 28th, Sir John Bradfield (1942) discusses his 36 years as the College's Senior Bursar. Please click on the link below to get a flavour of his talk. Prof David MacKay (1985) compares the potential footprints of shale gas operations and wind farms. Read more: http://bit.ly/1tUDmXf. Zhi-Kuang Tan and Professor Sir Richard Friend (1971) use perovskite to make low-cost LEDs which could potentially open up a wide range of commercial applications. Read more: http://bit.ly/1l2d85u. The 1st Eastern General Hospital had its headquarters in Trinity College during WWI. Read more: http://bit.ly/1oarGQ3. Dr John MacGinnis (1982) uncovers evidence that clay tokens were still being used for 'book keeping' thousands of years after the advent of writing. Read more: http://bit.ly/1AoEcQO. Research by Prof Simon Baron-Cohen (e1995) and Dr Meng-Chuan Lai finds that on average both males and females with autism show an extreme of the typical male mind. Read more: http://bit.ly/1rBZ1UT. 'The Man Who Knew Infinity', based on the life of Mathematician Srinivasa Ramanujan (e1918), to be filmed at Trinity College. Read more: http://bit.ly/1A9JyiJ. As part of the Wren Digitisation Project, there are now 200 manuscripts freely available online. Please visit: http://sites.trin.cam.ac.uk/james/ to search. Judith Weir (Visiting Fellow Commoner in Creative Arts 1983-85) prepares to be master of the Queen's music. Read more: http://bit.ly/1jSYmgw. Study by Dr Julia Gog (1994) finds that the 2009 spread of 'swine flu' in the US was largely due to short-range travel, mainly by school children. Read more: http://bit.ly/1lW9cwU. Study led by Prof Alan Short (1974), finding that the majority of hospital wards may be at risk of overheating, is referred to in report by the Committee on Climate Change. Read more: http://bit.ly/1joLQ8G. There will be a two-part documentary about University Challenge shown on BBC2 next week. Episode 1 will air on Monday 7th July at 7.30pm and Episode 2 will follow on Tuesday 8th July at 8pm. The series follows various teams, including Trinity, as they prepare for and take part in the series this year. Note that this is not the team that won the recently aired series but the team that has been filming recently, competing for the 2015 trophy. You can find out more about the show at: http://www.radiotimes.com/programme/cyjb42/university-challenge-class-of-2014. Some exciting finds from 1914 have recently come to light at the College. Read more about them, and how they relate to the upcoming WWI exhibition. http://bit.ly/1mE7f8g. Research by Prof Rebecca Kilner and Dr Christopher Town (1997) finds that birds develop signature patterns to distinguish cuckoo eggs from their own. Read more: http://bit.ly/1q84SSt. Dr Glen Rangwala (1993) on the Iraq crisis. Read more: http://ind.pn/1lN8zLu. Sir Timothy Gowers (1982) comments on the price of academic journals. Read more: http://bit.ly/1kJgDae. Dr Sachiko Kusukawa (1986) reveals what William Courten bought in 1698 from more than 80 individuals. Read more: http://bit.ly/Suhncf. Finalists for Lord Wolfson's (1986) 'Wolfson Economics Prize 2014' have been announced. Read more: http://bit.ly/1xgQHMQ. Materials scientist Professor Mark Blamire (1979) and engineer Professor Bill O’Neil discuss how research in Cambridge is helping to advance the material world. Read more: http://bit.ly/1x5kjN8. Study by Prof Simon Baron-Cohen (e1995) finds that children who later develop autism have elevated levels of steroid hormones in the womb. Read more: http://bbc.in/SpLP7D. Dr Gerhard Fasol (1978) interviewed by The Economist about Japan's energy situation and the Prime Minister's new energy policy. Watch the video: http://bit.ly/1lQSb7H. Former Master Lord Rees (1960) is the Chair of the Longitude Prize Committee 2014. Read more: http://www.longitudeprize.org. Prof Sir Partha Dasgupta (1962) argues governments should change how they quantify 'investment' when calculating GDP. Read more: http://bit.ly/1nnXrSt. Feature on Isaac Newton's (1661) papers held in the University of Cambridge Library. Read more: http://wrd.cm/1o1awoy. Dr Suchitra Sebastian (e2005) comments on recent developments in superconductors. Read more: http://wrd.cm/1iOtyXq. Professor Jason Chin (e2007) discusses breakthroughs in the creation of synthetic forms of DNA. Read more: http://bit.ly/1mUGK5f. Prof. Rebecca Fitzgerald (e2002) discovers gene that may lead to new treatments for oesophageal cancer. Read more: http://bit.ly/1uY5Jpn. Clare Clark (1985) shortlisted for the 2014 Sunday Times EFG Short Story Award. Read more: http://thetim.es/1spKril. Polly Courtney's (1998) 'Self Publishing Professionally' series. Read more: http://bit.ly/1fTE4lt. Professor Michael Edwardson (1973) and Tony Jackson (Department of Biochemistry) discover that structure of sodium channels in cells is different than previously believed, which may lead to improvements in drugs to treat cardiac and pain conditions. Read more: http://bit.ly/1iBPgxm. Professor Ross Anderson (1974) comments on possible HMRC plans to sell personal financial data to private firms. Read more: http://bit.ly/1iaN99j. Rupert Goold (1991) directs King Charles III. Read more: http://nyti.ms/1hVbVUW. Professor Ross Anderson (1974) argues that it is impossible to fully anonymise medical data for use in research and that there is a risk of individuals’ privacy being breached. Read more: http://bit.ly/1kc9brm. Dr Hugh Hunt (e1990) discusses wave motion using example of a 'slinky' and helps BBC's The One Show set world record. Watch at: http://bbc.in/1lPwzxk (21 minutes in). Huge congratulations to our University Challenge team (Richard Freeland (2011), team captain Ralph Morley (2011), Filip Drnovsek Zorko (2010) and Matthew Ridley (2011) for their 240-135 victory over Somerville College! Read more: http://bit.ly/1svfrhU . Watch the final at: http://bbc.in/1hnHexq. Thought for the Day with Rev Dr Michael Banner (e2006). Listen at: http://bbc.in/1kmM8si. Anthony Bolton (1968): What I learnt in three decades of investing. Read more: http://bit.ly/1hqET37. Video of James Poskett's (2012) study revealing how racist ideas and images circulated between the US and Europe in the 19th century. Watch: http://bit.ly/1hqRzDw. Professor Peter Keevash (1995) has proved the Existence Conjecture for combinatorial designs, answering a question of Steiner from 1853. Read more: http://bit.ly/NJoHOX. Professor Eugene Lemcio (1973) has published 'Soaring with St. John', a teaching-learning guide to understanding the Fourth Gospel. More information at: http://amzn.to/1nT6e3a. Congratulations to Dan Piponi (1985) on winning an Academy Award for Technical Achievement for the creation of the ILM Plume system. A look through the Guardian archive at changes to student life and higher education. Read more: http://bit.ly/1hvesHf. Professor Sir David Baulcombe (e2009) leads report arguing that GM crops should be regulated in the same way as conventional crops. Read more: http://bit.ly/1lDdnQc. Report on the 6th Ludwig Boltzmann Symposium Tokyo, organised by Dr Gerhard Fasol (1978) to commemorate his Great-Grandfather's 170th birthday. Read more: http://bit.ly/1njg7Xw. Further coverage of research on the decline of Bronze Age 'megacities' due to climate change. Read more: http://bit.ly/1f0JVy5. Research by Professor David Hodell, Dr Cameron Petrie (e2011) and Dr Yama Dixit links decline of Bronze Age ‘megacities’ to climate change. Read more: http://bit.ly/1crn26R. Emily Vasiliauskas (2007) wins Porter Ogden Jacobus Fellowship, Princeton University's top honour for graduate students. Read more: http://bit.ly/NtQcw6. Dr Nigel Woodcock (1973) comments on the increase of sink holes. Read more: http://bit.ly/1fBJryW. Prof. Nicholas Thomas FBA (e2006), Director, Museum of Archaeology and Anthropology, takes BBC Radio Four’s Inside Science on a tour of the Discoveries exhibition at Two Temple Place, London. Listen: http://bbc.in/1jG751e. Why Cambridge is at the heart of Britain's economic recovery. Read more: http://ind.pn/1gdHOJw. Interview with Amanda North (1978) as she tells her courageous story about the Boston Marathon bombings. Watch: http://bit.ly/1gb7MgL. Dr Madan Babu (2001) wins 2014 Colworth Medal. Read more: http://bit.ly/1mfIWUn. Coverage of Amber Ruigrok, Prof. John Suckling & Prof. Simon Baron-Cohen's (e1995) study revealing differences between male and female brain structure. Read more: http://ind.pn/1dnuowe. Congratulations to our University Challenge team for their 280-105 victory over SOAS last night! Watch: http://bbc.in/1g398fF. Peter Biar Ajak (2013) on South Sudan's Unfinished Business in the New York Times. Read more: http://nyti.ms/1g1JjN0. Fascinating interview with Stephen Freer (1938) about his time at Bletchley Park. Read more: http://bit.ly/1fX13Hf. Professor Robin Carrell (e1987) finds protein that modifies thyroid hormone levels according to body temperature, which helps Aboriginal people survive hot climate. Read more: http://ab.co/1dNi6Zg. Dorit Hockman (2008) ranked in top six winners of 2013 Nikon Small World Photo-micrography Competition. Read more: http://bit.ly/1i6huDi. Professor Ross Anderson (1974) comments on virus risk in smart devices. Read more: http://econ.st/1dU6l9t. Dr Glen Rangwala (1993) comments on disputed reports that population of Iraq is increasing. Read more: http://bbc.in/1hNLofu. If you are still receiving The Fountain and/or the Annual Record by post and would prefer to read it/them online, please let us know. For past editions of The Fountain and Annual Record, please click here.